and then print right from the sprocket app! Download the HP Sprocket app from hpsprocket.com/start or from your mobile device store. With the app installed, grab your sprocket and turn it on. On your mobile device, open Settings and turn on Bluetooth. It might take five to ten seconds for your sprocket to appear. Once it appears, select it. 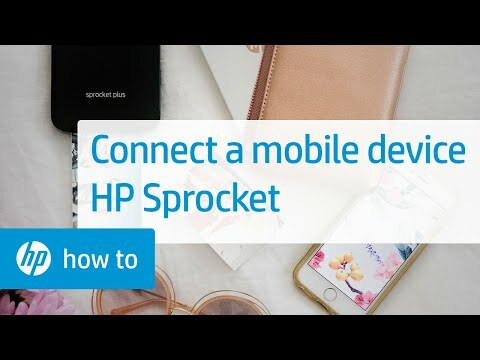 Your mobile device and sprocket printer connect automatically. If prompted, allow the sprocket and device to communicate. Verify the connection in the sprocket app. If you see a green dot and the word Connected at the top, you're good to go! For device connection issues, getting the latest firmware might resolve the problem. Before updating your printer firmware, check the battery percentage and verify it's charged at least fifty percent. From the sprocket app home screen, tap the Menu icon, tap sprocket, and then tap Printers. If there's an update available, select it, and wait for the update to finish. The update takes several minutes. Don't close the app or open any other apps until the update completes. Now you can take photos from your device, send them to your sprocket, and print them anytime you want!